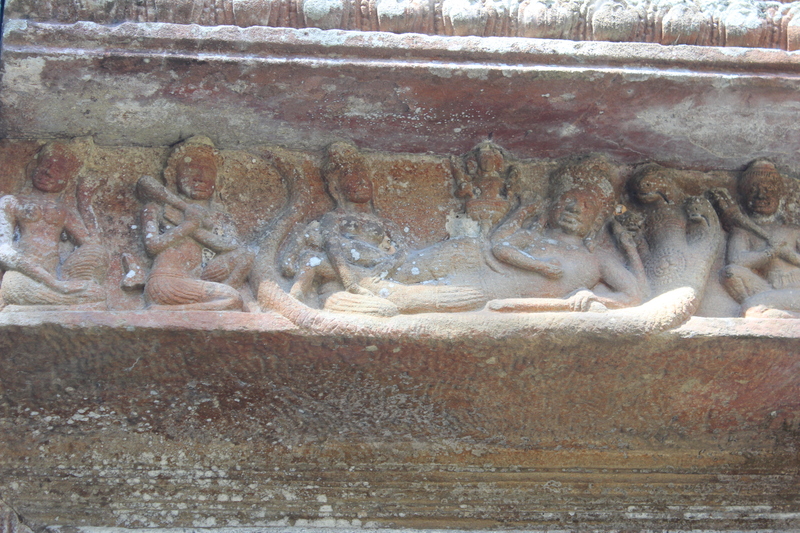 The friendly diplomatic relations maintained by Rajaraja I and the subsequent military conquests of his son Rajendra Chola I in connection with the Kingdoms of Southeast Asia and the consequential increase in the influence of the Tamil Trader community in Khmer temple architecture has been discussed in the previous post. 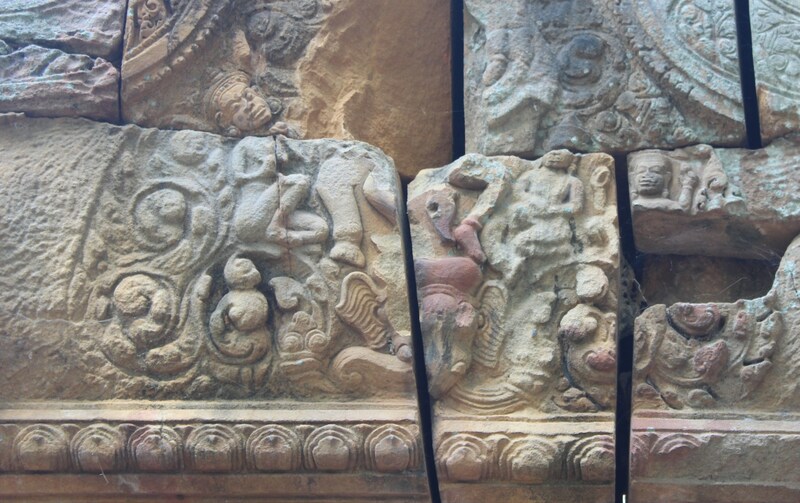 The impact of the influence of Maritime Tamil Traders through the sculpture of Karaikkal Ammai – an innovative introduction along with Dancing Shiva in Khmer temples, which was the pioneer architectural excellence of Chembian Madevi in Chola Temples in Thamizhagam/Thamilagam from mid 10th century ACE is the focus point of this series of posts – ‘Ammai in Southeast Asian Temples’. 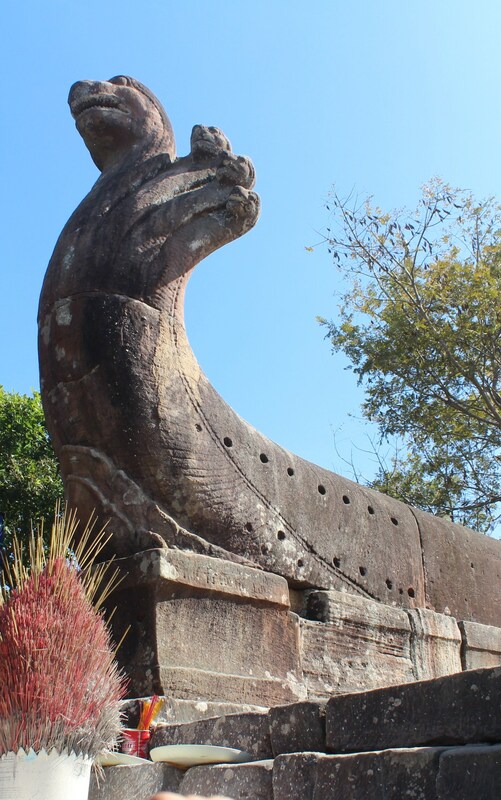 In this post, we continue to concentrate on the Khmer temples with the sculpture of Ammai, but with a shift from today’s Cambodia towards the north-east region of today’s Thailand, which is presently called Isan. 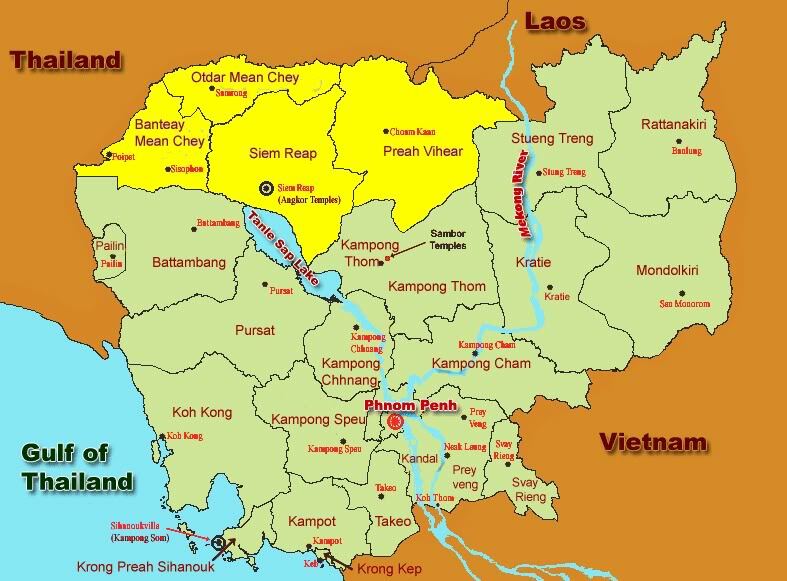 The Isan region falls to the north west of today’s Cambodia and shares borders with both Laos and Cambodia. 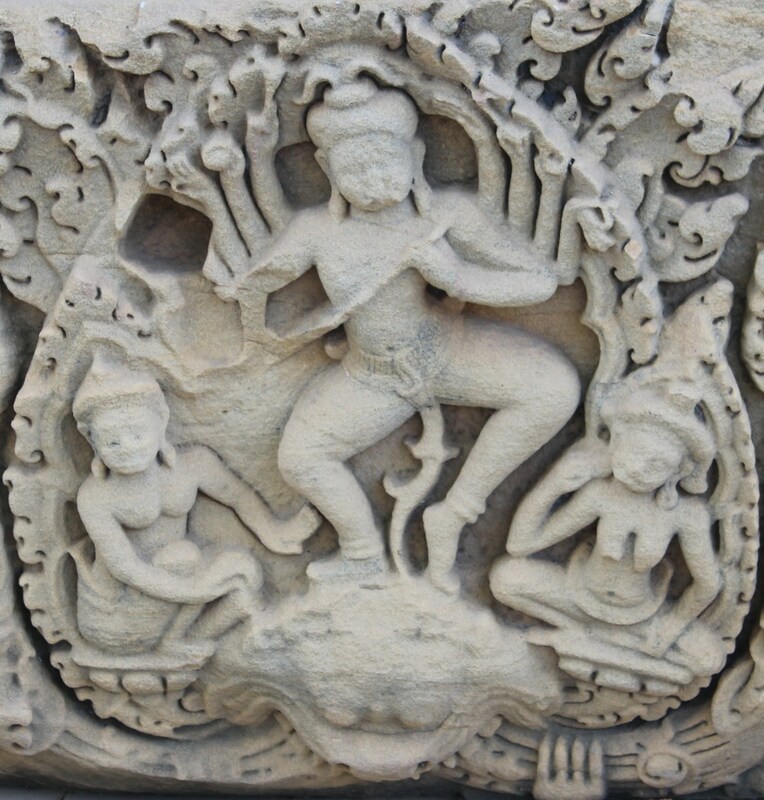 The facts pertaining to the above mentioned three faceted Khmer Expansion during the reign of Suryavarman I, are dealt in an attempt to search evidences, which are epigraphic and non-epigraphic in nature, for the inclusion of the sculpture of the Tamil Saiva Saint, Karaikkal Ammai in Khmer Temples. The Khmer focus on today’s north-east Thailand or beyond and north of Dangrek Range is believed to have gained momentum during the reign of Rajendravarman II (944-968 ACE). However, it was only after Suryavarman I claimed the Khmer throne in the first decade of the 11th century ACE, that the Khmer expansion took a giant leap, occupying several provinces in today’s Isan and even beyond. Mitch Hendrickson (currently Asst. Professor, Department of Anthropology, University of Illinois, Chicago) holds a Doctorate in Archeology. He focuses his research on communication systems and expansion mechanisms of the Khmer Empire between 9th to 15th centuries ACE. 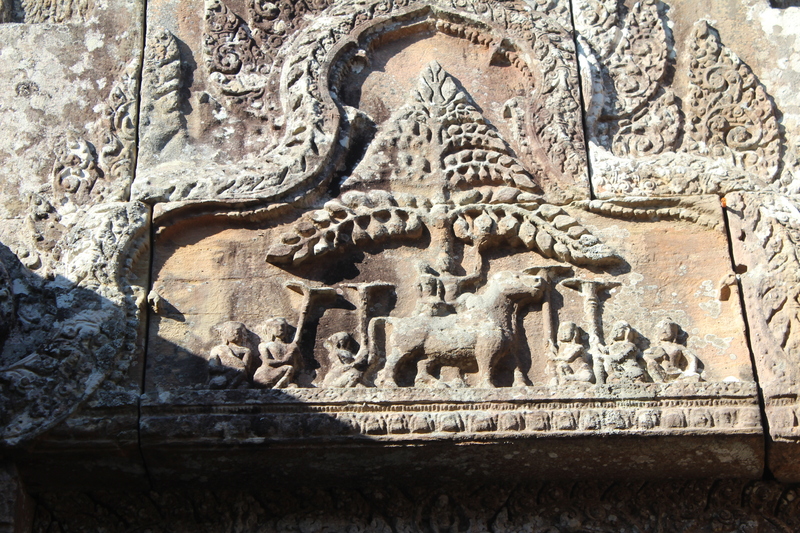 His 2012 publication – Connecting the Dots: Investigating the issue of transportation between the temple complexes of the medieval Khmer (9th to 14th centuries AD), examines the transport routes established as links between various Khmer temples. His paper brings out important geographic and political dimensions of the reigns of various Khmer Kings combined with religion. The research reveals the road routes established by Khmer Kings along the important temples they built and also provides a different interpretation on the connectivity of these temples after the inclusion of several provinces of Dvaravati region (north western region of today’s Cambodia) into the Khmer territory. It also provides us additional details on Suryavarman I and his geographic expansion and the efforts made by him to increase mobility to and from the temple sites built and renovated by him, in Cambodia and northeast Thailand. 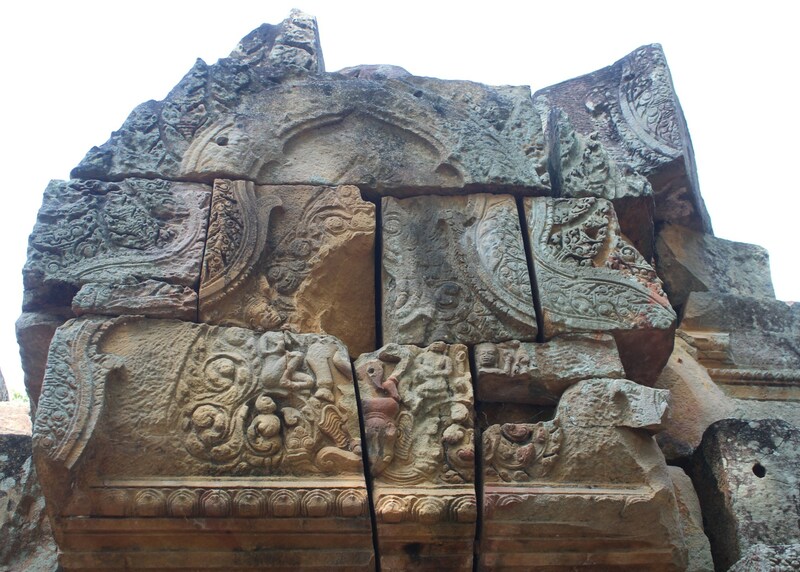 If, as assumed, the Khmer temples are part of a greater cultural landscape under politico-religious control, an examination of connections at the regional and supra-regional scales will provide insight into the internal dynamics of the Khmer empire and its geographic history. This analytical paper on the communication corridors of Khmer Kings gives us fascinating details on the expansion of the Empire and the far flung regions controlled by different Kings, in specific context of this paper, Suryavarman I. The second significant feature is the restricted size of royal territories until the reign of Suryavarman I in the early 11th century. 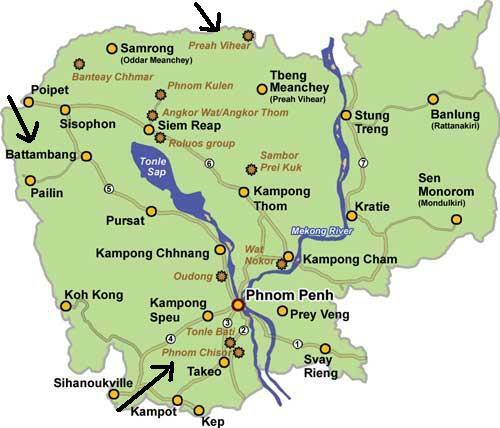 At this time the focus expands significantly to the northwest and south of the Tonle Sap Lake. Interestingly, the areas influenced by subsequent kings largely mirror the 11th century occupation, which suggests that regional communication was formally established at this time. In the picture below, the author shows the communication corridors of Kings, necessarily used to develop transport routes between temple sites. Additionally the picture also throws light on the comparative mapping of the geographic/political Khmer expansion through their religious entities and storehouses of cultural refinement – ‘Temples’. 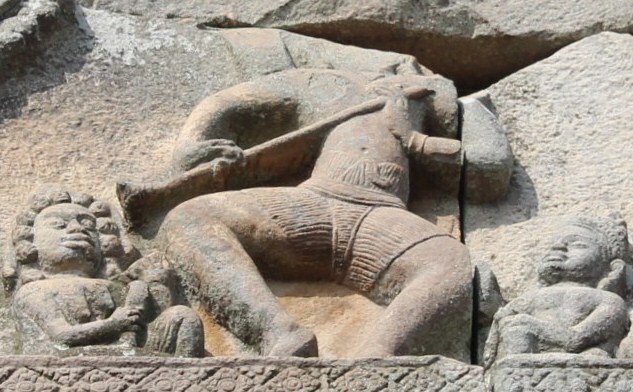 After Udayadityavarman I, the sites influenced by Suryavarman I in the first decade of the 11th century ACE show his sturdy grip as far as the western regions of Cambodia, forging into Dvaravati region. The significant geographic expansion aided in the creation of culturo-religious institutions in form of temples in the newly extended territory. 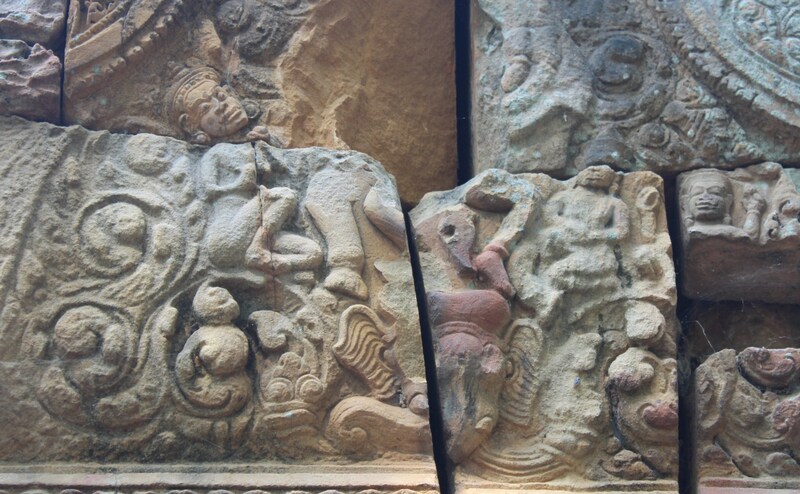 Pali Chronicles – the Chamadevivamsa and the Jinakalamali (both belonging to the 15th century ACE) and Mulasasana, talk of the story of the Khmer expansion in the Menam Basin and also mention the name of ‘Kambojaraja’. Even if the chronicles can be brushed aside as imaginary, Coedes clarifies that – ‘ we nonetheless have clear manifestations of Cambodian expansion in the era of Suryavarman I in the region west of the Great Lake, where his inscriptions are particularly numerous’. (George Coedes, pg.137, Three Great Kings, The Indianized states of Southeast Asia). 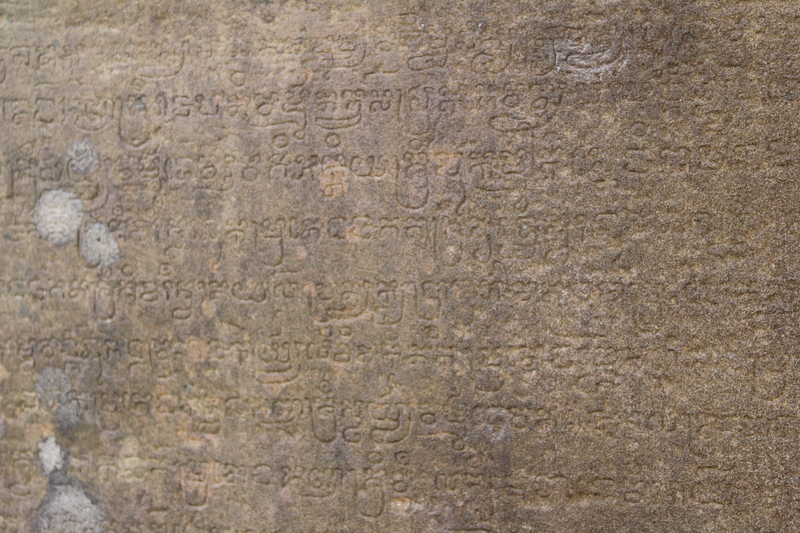 This inscription of Suryavarman I from Lopburi, mentions that the Buddhist monks belonging to two sects – Mahayana and Sthavira and the Brahmins – Tapasvi Yogi lived together in Lavo. 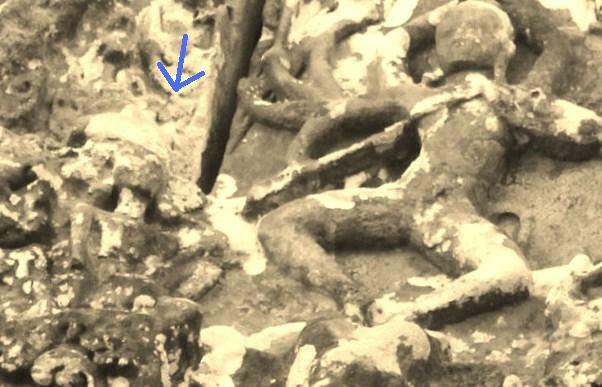 This is not only a proof of Suryavarman I’s Khmer expansion in the Dvaravati region but also a proof of religious secularism encouraged under him. 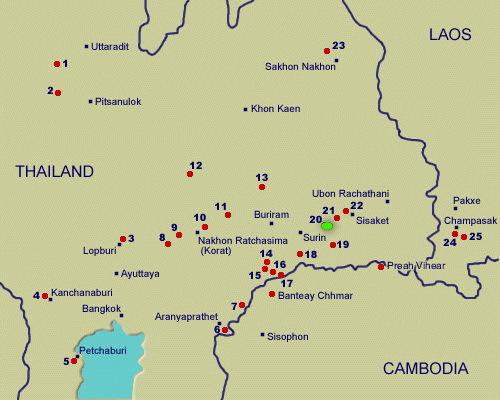 Above map shows Lopburi and Nakhon Ratchasima in arrows. The extent of Suryavarman I’s expansion beyond the Dangkrek Mountains, with Prasat Hin Phimai, which falls under the province of Nakhon Ratchasima and reaching as far as Lopburi was only a beginning to his commercial and architectural expansion – bringing economy and religion under a single umbrella of political conquests…. much similar to Rajendra Chola I, his contemporary Tamil Emperor, whose political conquests resulted in economic and religious expansion of Tamil culture as far as China – beyond Southeast Asia. The geographic expansion of Khmers under Suryavarman I has been briefly discussed above. What would seem most important in the study of the inclusion of iconography of Karaikkal Ammai in Cambodia and north east Thailand is the religious expansion during the first half of the eleventh century. But, there is one more important theory that makes the powerful chain of geographic and religious expansions stronger – that is Economic Expansion. The economic expansion or commercial development of Khmer Kings is a topic of separate, in-depth analysis- already done by several scholars and researchers. The economy aspect of any King’s rule occupies a significant place in his political and religious influences taken from and spread towards other friendly and non-friendly nations. Significantly, economic relations might be more expansive than political, as it additionally aids in cultural and religious give and take. 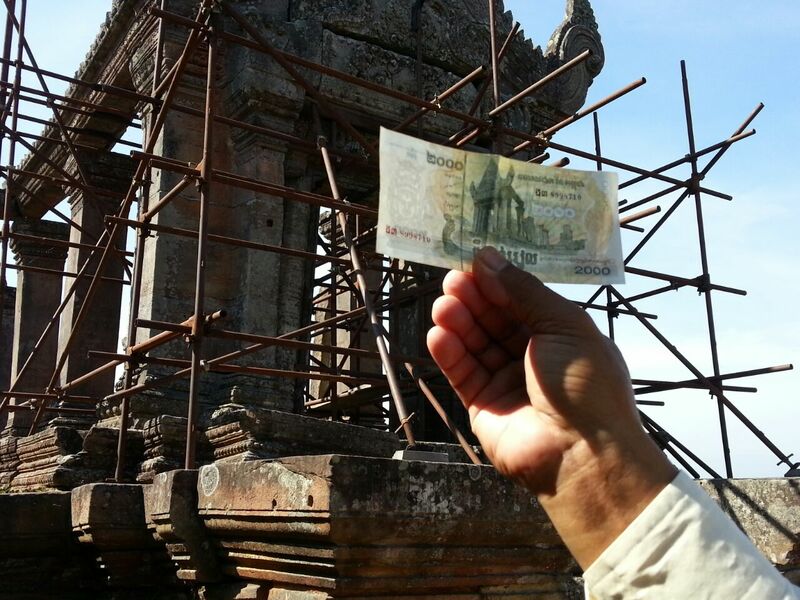 With the focal point on Karaikkal Ammai in Khmer temples, the economic expansion of Khmer Kings needs to be explored. The political and economic expansions of Rajaraja I and his son Rajendra I of the Chola Empire in Thamizhagam were discussed in the previous post. 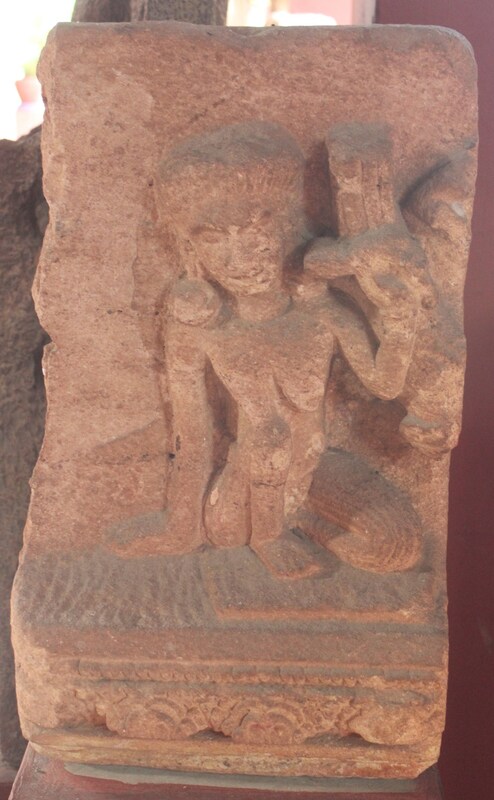 The maritime Tamil merchants and their stronghold in Southeast Asian economies had led to various cultural reciprocities, the most beautiful among them being the inclusion of Karaikkal Ammai, the demon devotee of Lord Shiva in Khmer Temples. As written previously, the Tamil Economic upheaval was at its apex during the reign of the father-son duo – Rajaraja I and Rajendra I. Inscriptions on Rajendra I’s Southeast Asia conquests are proof to the political and economic might of the Tamils in the early 11th century ACE, the period corresponding to the reign of Suryavarman I in Khmerland. Inscriptions in Thamizhagam show an uninterrupted process of maritime trade and political stronghold of the Tamils in Southeast Asia, from Rajaraja I’s successful friendly relations, followed by a new policy of political conquests by son Rajendra I. 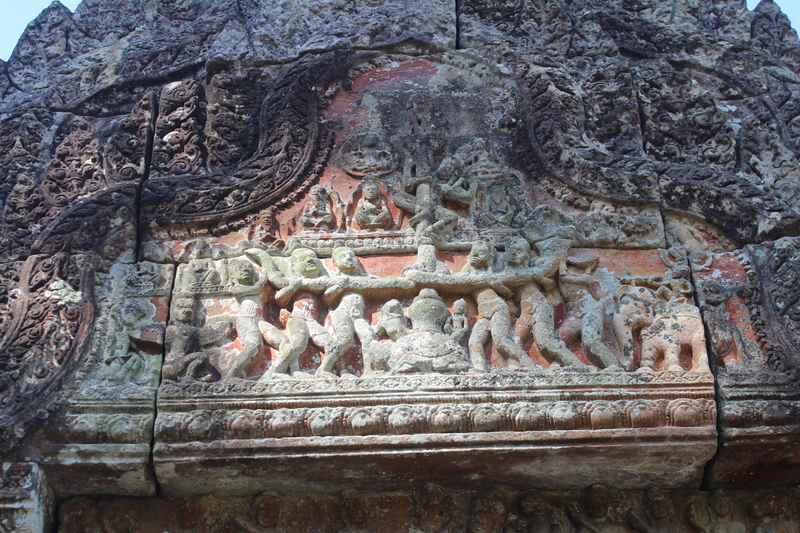 A century later to Rajaraja I’s reign, Kulottunga Chola’s inscriptions in 1114 ACE, talk of friendly relations sought by Suryavarman II with the Tamil Kings. Inscription of Kulottunga I that a stone was provided by Suryavarman II to the Shiva temple of Chidambaram (Chittrambalam or Thillai being its original Tamil name). Researchers and Scholars have analysed the evidences of the glorious commercial expansions under the rule of Suryavarman I, who incorporated the west of the core Angkor area extending till Lopburi (Lavapura) into the then existing Khmer territory. The corresponding cultural and religious networks he created within and beyond his territory might bring in clues to the inclusion of Karaikkal Ammai in Khmer Architecture. The interest that Suryavarman I showed in his political expansion, continued with the immense emphasis he laid upon administrative and commercial activities internally and internationally. He focused on enhancing trade and commerce of his kingdom by integrating markets of his then existing territory and newly captured provinces. One of his primary concerns was to dominate the economic scene among the neighboring states, by extending friendly relations with the South Indian Cholas. Kenneth R Hall’s extensive research on Khmer commercial development during the reign of Suryavarman I has indeed left behind ample references that relate to the Tamil maritime links in and around the Khmer territory. Epigraphy suggests that prior to Suryavarman’s reign, goods of Chinese origin had entered the Khmer core through the eastern part of the domain, as the inscriptions concentrate on commercial activities in that direction (Coedes: IC,v6; 183-86; Aymonier: 1900-1904, 443). 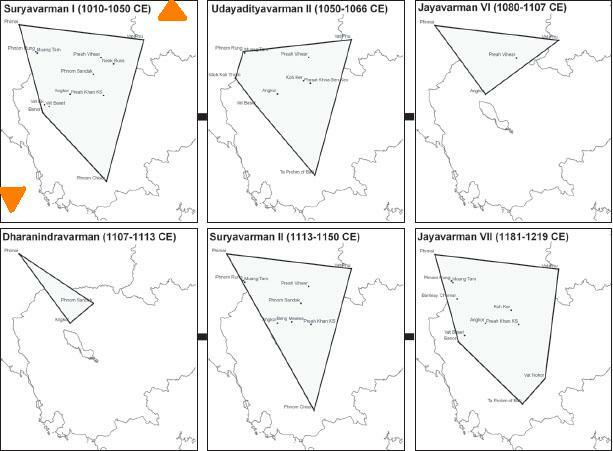 Inscriptions from Suryavarman’s reign reverse this eastern focus, being concentrated in the western region. While the proliferation of inscriptions in the newly integrated areas is a reflection of the period’s administrative expansion, there are strong commercial implications as well. 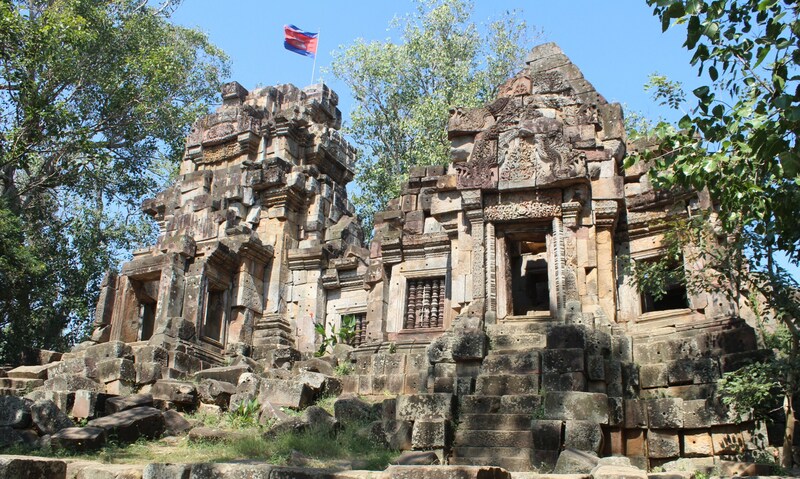 Once the Khmer had established control in Lobpuri and areas to the south, goods brought from China to say Phanom Wan no longer needed to cross the mountains to the east. Instead, they could reach Lopburi and Phanom Wan via the Chaophraya River system, the same route being used for goods that were coming from India, Persia, and Arabia via Tambralinga. Such a direct interaction with the international routes no doubt was viewed as an asset to the internal development of the Khmer economy in Suryavarman’s time. These economic strong points of the Khmer Empire during the rule of Suryavarman I, could be seen in light of the economic stronghold of Rajendra Chola I across Southeast Asia. While Suryavarman I opened new trade entry points through Phimai and Lopburi, west of Angkor, one of his prime motives as the reigning Khmer Emperor was to surpass the Srivijayas and hail supreme in Southeast Asian Economic Arena. Despite two powerful trade economies – China to the north and Tamil Cholas to the far west of the Khmer Empire of the day, Suryavarman I was very active in establishing a hugely successful Khmer Commercial Presence among the immediate neighboring kingdoms of Southeast Asia, thereby dominating the trade routes of Isthmus of Kra. Pg.320, Hall, Kenneth R. “Khmer Commercial Development and Foreign Contacts under Sūryavarman I.” Journal of the Economic and Social History of the Orient, vol. 18, no. 3, 1975, pp. 318–336. JSTOR link : www.jstor.org/stable/3632140. Pg. 321, Hall, Kenneth R. “Khmer Commercial Development and Foreign Contacts under Sūryavarman I.” Journal of the Economic and Social History of the Orient, vol. 18, no. 3, 1975, pp. 318–336. JSTOR link : www.jstor.org/stable/3632140. As deciphered by Coedes, ‘Vap’ could refer to a trader from a foreign country, and ‘Vanik’ might indicate a merchant traveling throughout the territory of the Khmer ruler . 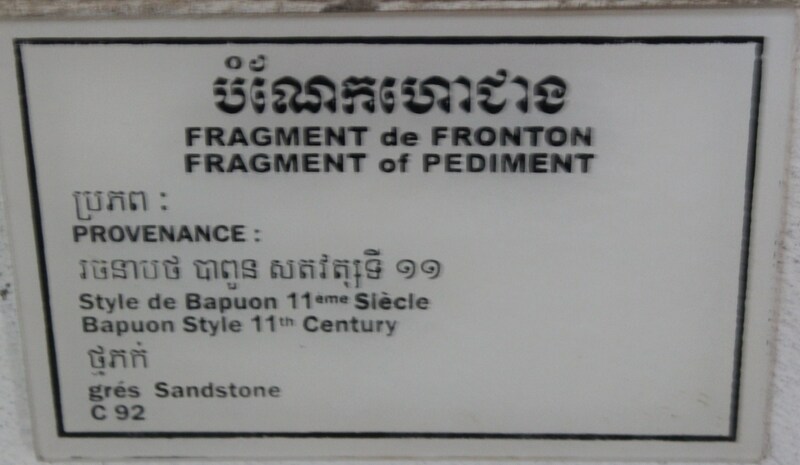 According to Hall, among the inscriptions found at Vat Baset and Svay Chek (Bantay Prav), ‘Khlon Jnval’ denoting the local merchants in khmer language seem to dominate in Vat Baset, proving it to be an important local communication center; whereas Bantay Prav inscriptions show that ‘khlon jnval vanik’ denoting traveling merchant, occupies a greater place. Hence, Bantay Prav could have been an important center of communication and exchange between the Khmer core and its western provinces, with Lopburi becoming part of Khmer Land after Suryavarman I’s expansion. Six of seven inscriptions of a commercial nature from these two temples date to Suryavarman’s reign, while the seventh, an inscription from the reign of Harshavarman III (1071), is the latest inscription examined. Pg. 327, Hall, Kenneth R. “Khmer Commercial Development and Foreign Contacts under Sūryavarman I.” Journal of the Economic and Social History of the Orient, vol. 18, no. 3, 1975, pp. 318–336. JSTOR link: www.jstor.org/stable/3632140. 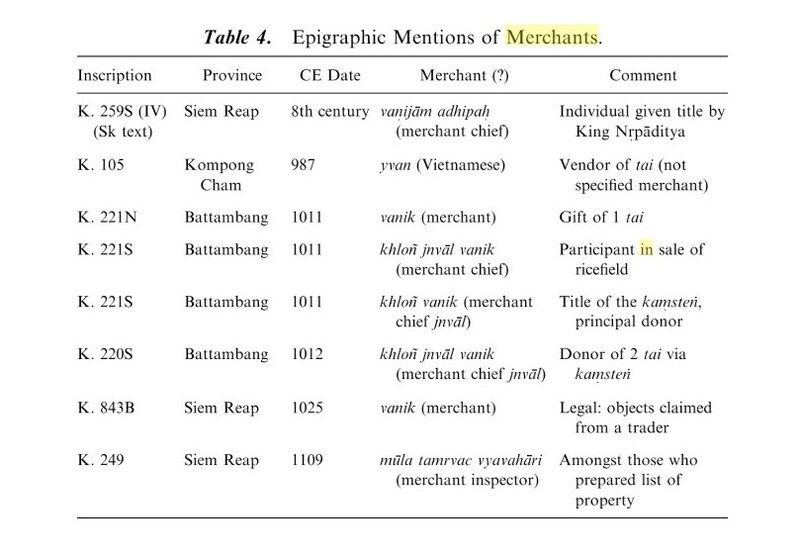 These terms regarding inland merchants during the period from mid 10th century ACE until last few decades of 11th century ACE, signify the extensive trade within the extended Khmer Territory. ‘Vanik’ is a borrowed word from Sanskrit which means Trader. This comment by Coedes has made more number of scholars and researchers believe the word ‘vanik’ to be of Sanskrit origin and this fact gets repeatedly mentioned in several later research papers and articles. Is ‘Manikkiramam’ derived from Vanik-gramam? Does the word ‘vanik’ have its root in Sanskrit as both these scholars say? Coedes’ Inscriptions du Cambodge was published in the year 1937 and Sastri’s Takuapa article was published in Journal of Malayan Branch Royal Asiatic Society in the year 1949, though written in 1948. K.A.N. Sastri’s previous and first article on Takuapa, prior to 1949 – ‘The Takuapa Tamil Inscription’ was published in the The Journal Of Oriental Research Madras Vol. Vi, in the year 1932. It is interesting to note that the Sanskrit connection is mentioned only in the 1949 article, after the publication of Coedes’ ‘Inscriptions du Cambodge Vol. III’. This stands true from the fact that Tamizhagam had been a Buzzing Economic Centre since centuries before Common Era. Also, glassware and beads that have been excavated from Southeast Asian coastal towns especially from Malaya and Thailand testify the gem trade between the Tamils and Southeast Asian friends that flourished from Tamil Ports. It is additionally well proven from available Tamil literary sources and travelogues by foreign authors from the early centuries of the 1st millennia that the Tamil Coastal Line was a busy business haven enjoying imports and exports between the Arabs and Southeast Asians. Trade with Southeast Asia already existed in the early historical period, the focus now (after mid 6th century ACE) shifted towards Southeast Asia, Srilanka and China. Thus the trading activities survived in the later periods. Thirdly not only the luxury goods but even the beads, either of semiprecious stones or glass, were a valuable item of trade. The central role of South India, especially Tamil Nadu, in the international gem trade has led Peter Francis (‘Early Historic South India and the International Maritime Trade’ by Peter Francis Jr.) to call the region the “Treasure Chest of the Ancient World”. Hence, the ambiguity regarding the word ‘Manikkiramam or Manigramam’ could be viewed wider with the merchandise of the traders – possibly gem trade and pearl fishery which has been much prevalent between the Malayan Peninsular States and Thamizhagam. In this case, the root of the word ‘vanik’ needs more scrutiny. A search for ‘vanik’ in early Tamil Literature gives new light to the belief of scholars. Before making its place in 11th century Khmer epigraphy, ‘vanik’ has found powerful usages in Literary Tamil Language. Before entering into ‘Bhakti Ilakkiyam’ (Saivite Devotional Hymns by Nayanmars and Vaishnavite Hymns by Alwars) which dominates 6th century ACE until 12th century ACE of Tamil Literary Scene, the Tamil Epic Silappadhikaram written in approximately the 2nd century ACE, mentions ‘Vanikar’. Who guards another’s interests as his own. 3.Puranaanuru (3rd century BCE -3rd century ACE) mentions vanigan and vaanigan in a few poems. this birth will help the next one. men before him who followed the right path! துணை அளவு அறிந்து நல்கினர் விடினே. and gives me a gift, even if it were tiny like millet! gems and gold brought from the mountains and ocean. The term ‘vanik’ that denotes merchants is available in Tamil Literary texts as early as 3rd Century BCE. This literary evidence that proves the usage of a particular word in a particular language, earlier than other languages, especially before Common Era and its continuous usage through several centuries across the next millenium- proves the root word of ‘Vanik’ need not be Sanskrit but most probably Tamil. The word ‘vanik’ seen in Khmer epigraphy from 10th to 11th Century ACE, also proves the continuity of the well established links of the Tamil traders which is known from travel notes of foreign authors- from as early as the last few centuries Before Common Era (Dr. Ma. Rajamanickanar on Periplus notes (70-100 ACE) on Chola Trade, pg. 106, Cholar Varalaaru) and literary evidences (Tamil Epics Silappadhikaram and Manimekalai that speak of Chola Maritime Trade with Western and Eastern countries in 2nd century ACE). The Takuapa Tamil Inscriptions in Thailand, the earliest epigraphic evidence of maritime tamil traders guild in Southeast Asia, provide clues to the continuous link of Tamil Vanigars/Traders from early centuries to the final centuries of the millennium. The Khmer Rulers, who have used the same word to denote the same group, which is merchants in their epigraphy, is yet again a proof of the powerful commercial activities of the Tamil Merchants, especially during the reign of Rajaraja I and his son Rajendra I, contemporary Tamil Empires of Suryavarman I. Apart from these names, one of the earliest of the Tamil-Brahmi Inscriptions found at Madurai Azhagar/Alagar Malai and Pugalur also finds mention of ‘vanikan’. These early Commom Era inscriptions again refer to traders of different commodities. These literary and epigraphic evidences in Tamil that show the usage of ‘vanikar’ and that dates from a time span extending from 4th century BCE (tolkappiyam) to 3rd century ACE, are enough proof for the roots of the word to have originated from Tamil Language. With no available literary/epigraphic evidence earlier than these, until a proven evidence of its usage is available in any other contemporary language – it is logical and indeed valid to claim the word could have its roots in Tamil. With both the terms, ‘vanigar’ and ‘vanika’ denoting merchants or traders been found mentioned in Sangam Tamil Literature and in Tolkappiyam – the oldest Tamil Grammar text found till today, ‘vanik’ could not possibly have its roots in Sanskrit. Apart from the root of the word, its usage in Tamil Literature associated with Tamil Economic activities, that is similar to denote economic activities in Khmer Land, a millenium later, when the Tamil Cholas were at their ‘Vanik’ best in Southeast Asia is certainly an element for further critical research. Literature centuries before Common Era, systematic Grammar of the language to produce such mature literature and a well established civilisation to cultivate long routed economic activities and strong rooted cultural reciprocities, the Tamils have left behind enough and abundant documentation through literature and epigraphy, the proof of their influences far and wide. It is for the learned scholarly world to recognise or wait for search of more evidences. Hundreds of centuries with limited evidences – literary, epigraphic and sculptural, History finds its decisions mostly in Probability. As mentioned in the previous posts, with an open-mind to accept new discoveries that would answer satisfactorily various ambiguities in history, with the same theory of Probability as per available evidences till today, this is an honest view on the Tamil and Khmer connection of the word ‘vanikar’ (available in khmer epigraphy as ‘vanik’) which means traders/merchants. Now, we come back to usage of the same word ‘vanik’ meaning traders/merchants in Khmer epigraphy during the reign of Suryavarman I. 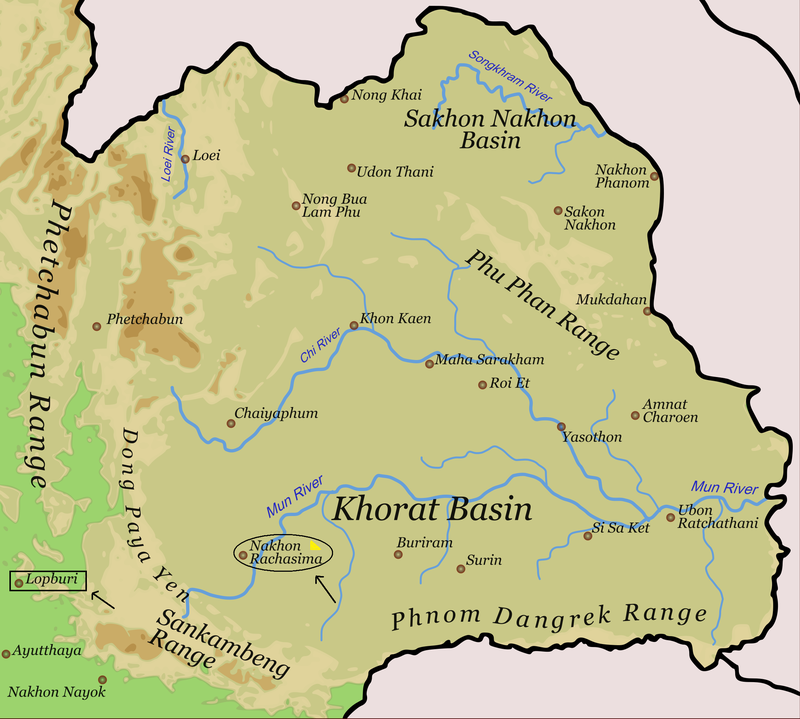 The terms ‘khlon vanik’ and ‘khlon jnval vanik’ meaning resident merchants and travelling merchants respectively as quoted by Kenneth Hall from George Coedes, should be seen in the light of Khmer economic development at its expansive best and political and economic stronghold of the Cholas in Southeast Asia under Rajendra I at all time high sidelining Srivijayas. Additionally, a wider view of the Tamil word ‘vanikan’ available in early Tamil Literary sources, would provide evidences of the comfortable positions enjoyed by Tamil Trader Settlements across centuries, not to ignore the Pallava influences seen in ancient provinces of today’s Thailand. It can also be seen that Vat Baset inscriptions under Suryavarman I leads in numbers. It is also to be noted that the term ‘vanijam’ inscribed previously in 8th century ACE undergoes a change in ‘vanik’ from the 10th and 11th century ACE inscriptions – a closer similarity to ‘vanikar’ of Tamil Language. Using services of merchants towards temple donations is a prevalent norm even today. Kings have always had close links with merchants and their community for religious and cultural innovations through Temples, which could be done easily with the wealth accumulated by and from the traders. 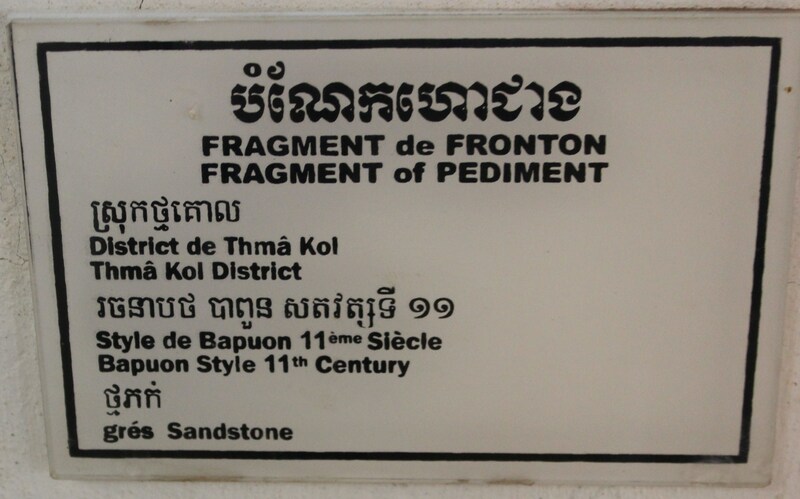 Khmer rulers couldn’t have chosen a different path and Khmer epigraphy provides abundant evidences to this. Pg. 332, Hall, Kenneth R. “Khmer Commercial Development and Foreign Contacts under Sūryavarman I.” Journal of the Economic and Social History of the Orient, vol. 18, no. 3, 1975, pp. 318–336. JSTOR link: www.jstor.org/stable/3632140. It is the author’s belief that the gifts given to Rajendra by Suryavarman were not intended to “save his own kingdom”, but to establish a friendly trade relationship between Cambodia and Chola ports. Pg. 334, Hall, Kenneth R. “Khmer Commercial Development and Foreign Contacts under Sūryavarman I.” Journal of the Economic and Social History of the Orient, vol. 18, no. 3, 1975, pp. 318–336. JSTOR link: www.jstor.org/stable/3632140. This core emphasis on victorious trade accomplishments of the Khmer Empire under Suryavarman I along the Isthmus of Kra, with the cordial relations of Tamil Cholas could well have contributed to the upsurge and higher influential positions of the Tamil Traders or ‘Vanik’ settled in Khmer territory. This upsurge in the positions of Tamil Traders could have further proved as a catalystic aid in the inclusion of the sculpture of Tamil Saint Karaikkal Ammai in Khmer Temples in Cambodia and north-east Thailand. 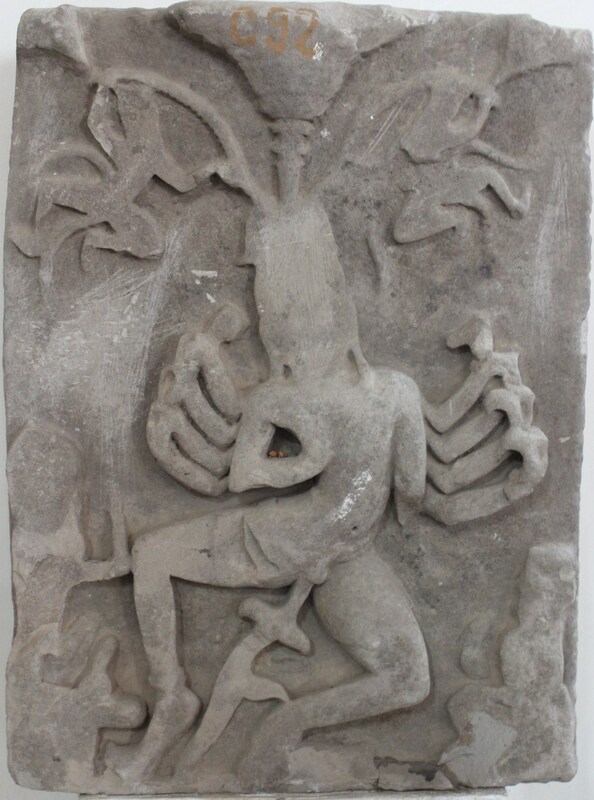 An important fact here – Karaikkal Ammai, the demon devotee of Lord Shiva from the Tamil country, also belonged to the same ‘Vanigar’(tamil) – trader – ‘vanik’ (khmer) community in 6th century Thamizhagam. It can be stated rather unambiguously that Karaikkal Ammai – the Pioneer Tamil Saint and Poetess of the Saivite Bhakti Movement in Tamil Land, who belonged to the Vanigar/Vanik/Trader community, would have been the star religious Ambassador for the Tamil Trader Settlements living in far eastern countries – including the land of focus of this research – Khmer Land under Suryavarman I. Hall, Kenneth R. “Khmer Commercial Development and Foreign Contacts under Sūryavarman I.” Journal of the Economic and Social History of the Orient, vol. 18, no. 3, 1975JSTOR. Dr. S. Sivasankaran, “State of Handloom Weavers, Weaving and Fabric in Tamilnadu Through the Ages”, International Journal of Interdisciplinary Research in Arts and Humanities, Volume 1, Issue 1, Page Number 95-103, 2016. 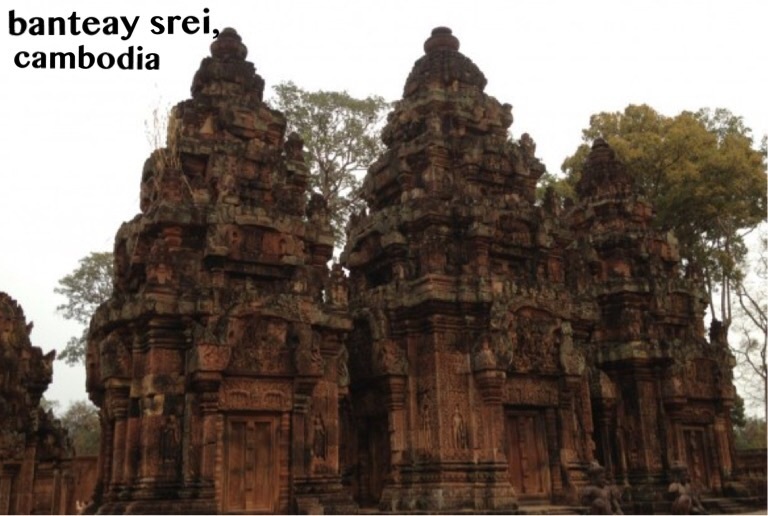 The next temple where Karaikkal Ammai is seen to closely enjoy the cosmic dance of Lord Shiva is Prasat Preah Vihear. Prasat Preah Vihear (called by the Khmers) or Prasat Phra Wihan (called by the Thais) is a magnificent temple situated on top of a 525 meter high cliff on the Dongrek mountains. The temple and the mountains lie between Cambodia’s Preah Vihear Province (north-western Cambodia) and Thailand’s Si Sa Ket Province (north-eastern Thailand). The construction of the temple had begun under the rule of Jasovarman (889-910 ACE) and completed during the rule of King Suryavarman II (1113-1145 ACE). Suryavarman II was the King who gave the Angkor Empire its most revered jewel – Angkor Wat. 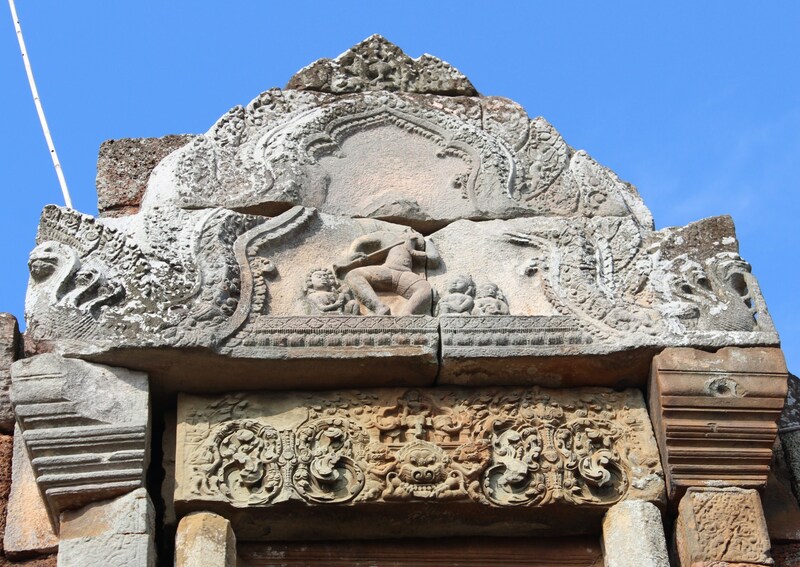 Yet, most of today’s standing structures and lintels of Preah Vihear were built by King Suryavarman I, the King who built the temples of our point of interest -Dancing Shiva with Karaikkal Ammai – Vat Ek, Vat Baset and Phnom Chissor. The Khmer Cliff Temple, occupied by Siam off and on, later affected by the Khmer Rouge Regime and then again by conflicts with Thailand used to be less accessible to tourists till recently. But that is not the case now. 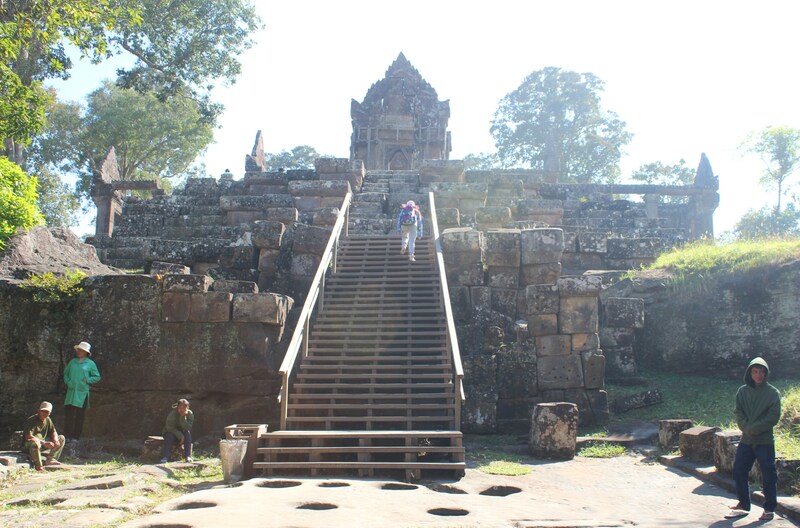 The magnificent temple can be reached by a few hours of travel easiest from Siem Reap. 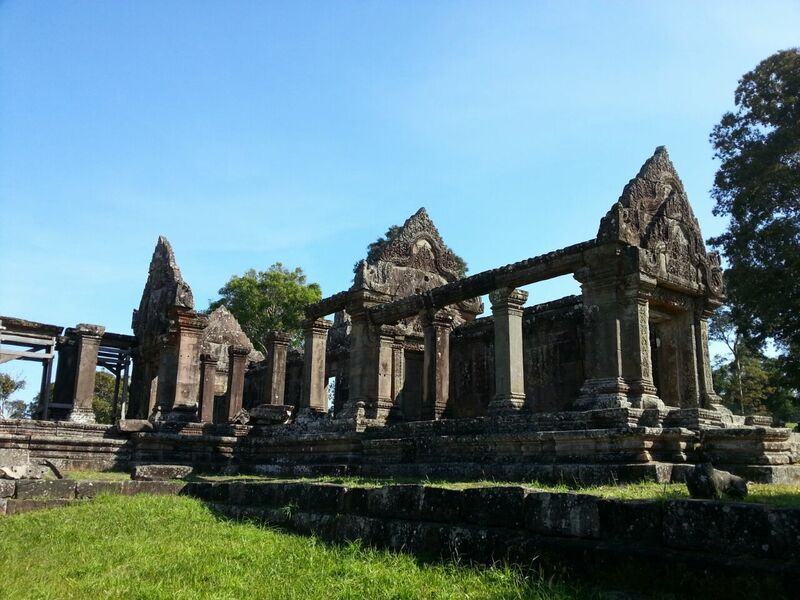 Or as we did combined with the ancient temples of Battambang, which is a longer route. Siem Reap seems to be a better option, with multiple ancient locations at easy reach. The former Washington Post foreign correspondent John Burgess has authored a book on Preah Vihear named ‘Temple in the Clouds’. Prasat Preah Vihear is truly too close to the clouds. The temple absorbs anyone into its charming architecture. It grabs the visitor into its intricate carvings, aesthetic designs and artistic enclosures. It is an architect’s Delight, archeologist’s Paradise, vivid traveler’s Adventure and a faithful worshiper’s Heaven. Preah Vihear is one of the greatest Khmer master pieces of all times with its massive structure which is truly captivating. Preah Vihear is unusual among Khmer temples in being constructed along a long north-south axis, rather than having the conventional rectangular plan with orientation towards the east. An inscription provides detailed account of Suryavarman II studying sacred rituals, celebrating religious festivals and making gifts, including white parasols, golden bowls and elephants, to his spiritual advisor, the aged Brahmin Divakarapandita. According to the inscription, Divakarapandita took interest in the temple and donated to it a golden statue of dancing Shiva known as Nataraja. Shiva temples often open to the east; they feature three towers, the north tower is dedicated to Vishnu, the central tower to Shiva, and the south tower to Brahma. 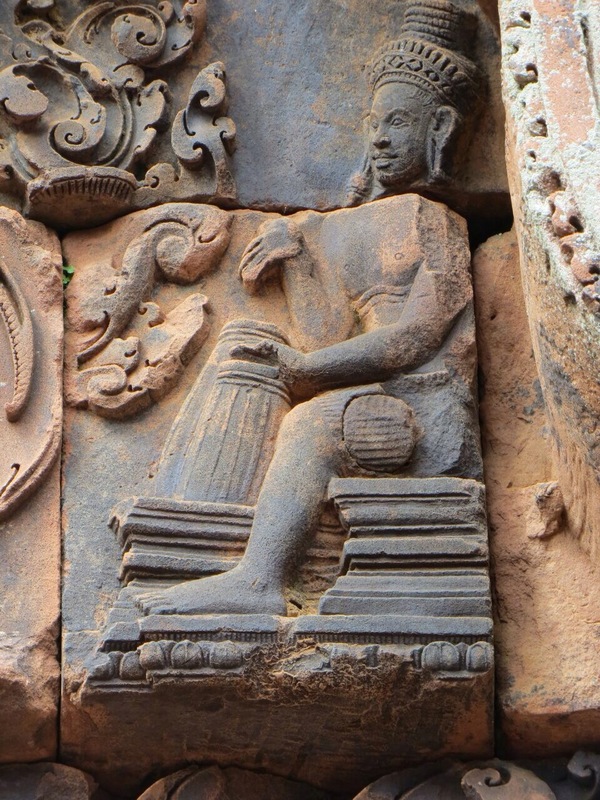 Preah Vihear: Sikhareshvara (Lord of the Summit). 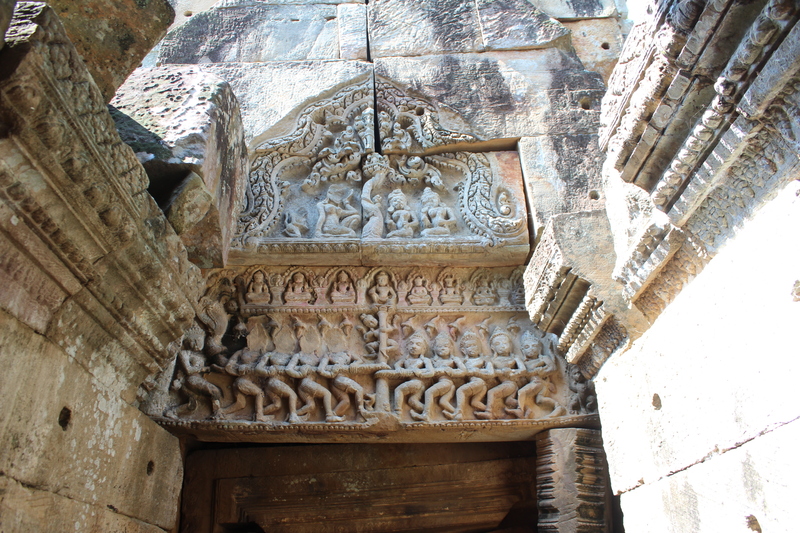 It is inevitable to show some of the sculptures beautifully carved in the lintels of the temple. The structure of Preah Vihear is classified into five Gopurams. The entrance of the Temple is marked by Gopuram V with its massive pillared walls and the trademark lintel, now in restoration mode. Walking towards the inner Gopurams numbered IV, III, II and I, one crosses a series of stairways with long walking paths. Each Gopuram stands stunning with its exclusive carvings depicting epic scenes and exclusive sculptural master pieces of Khmer temple architecture like the churning of ocean and reclining Vishnu. 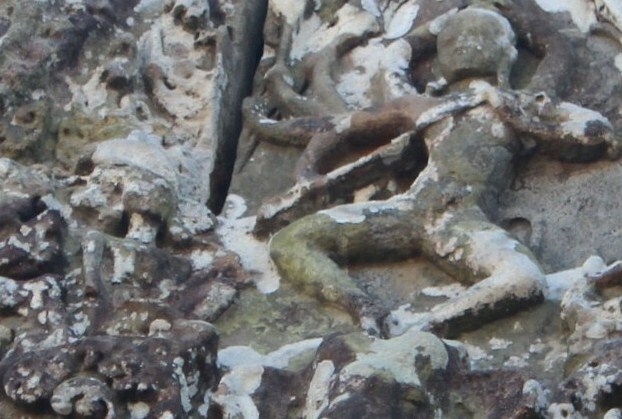 Karaikkal Ammai in Preah Vihear? Entry to the temple is through Gopuram V, then proceeds towards Gopuram IV and Gopuram III. As we enter Gopuram II, there lies the Main Sanctuary which is again a huge structure with beautifully carved lintels. The most striking feature of the Main Sanctuary is the ‘Dancing Shiva’. 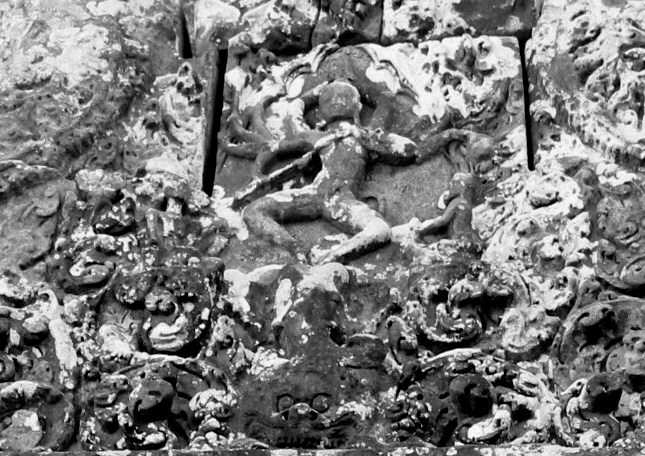 He is seen dancing on a head of an elephant over Kala. Shiva is seen dancing, and to the sides of the dancer to whose tunes the whole world seems to dance, are two characters playing instruments for the eternal dancer. 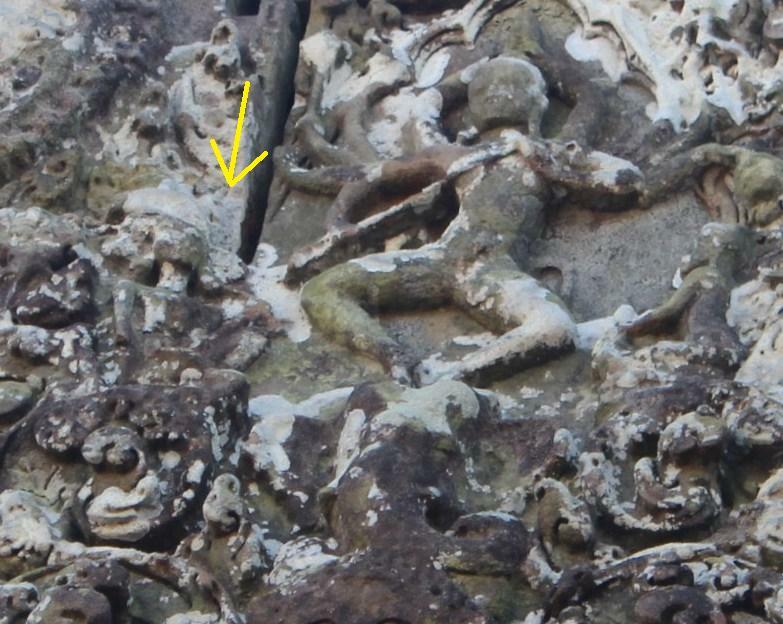 To the left of Shiva is the person with ‘oru muga muzhavu’ -a percussion instrument as in Banteay Srei. 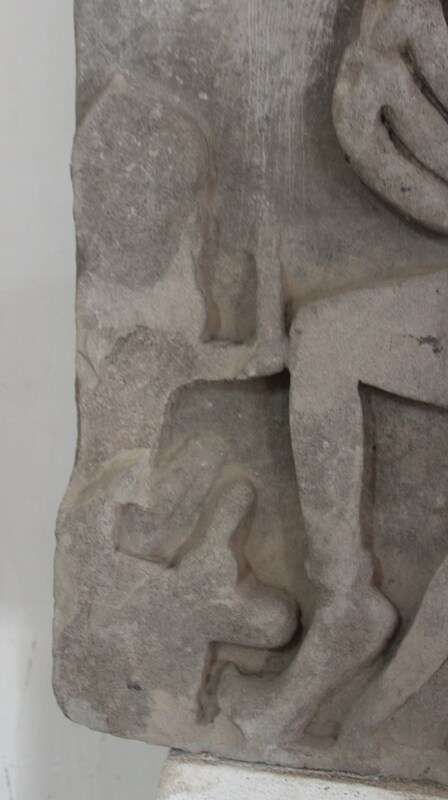 To his right, the lintel is in very bad shape, the sculpture of a person is very difficult to trace. Yet, seems like a squatted figure with a skinny body. Does the figure also hold ‘cymbals’ to provide additional music to the dancer? 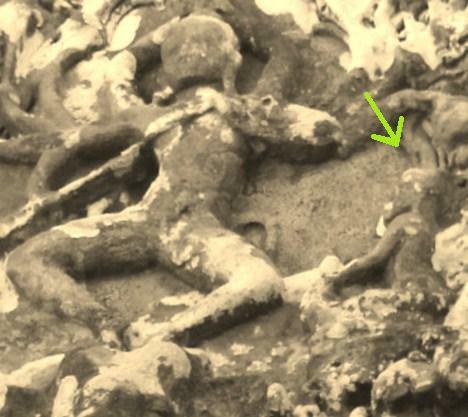 With the sculptures of Dancing Shiva so far seen, with the main characters on both sides, this squatted figure could certainly be that of Karaikkal Ammai. Whether it matches the iconography of Ammai, is for researchers to decide. 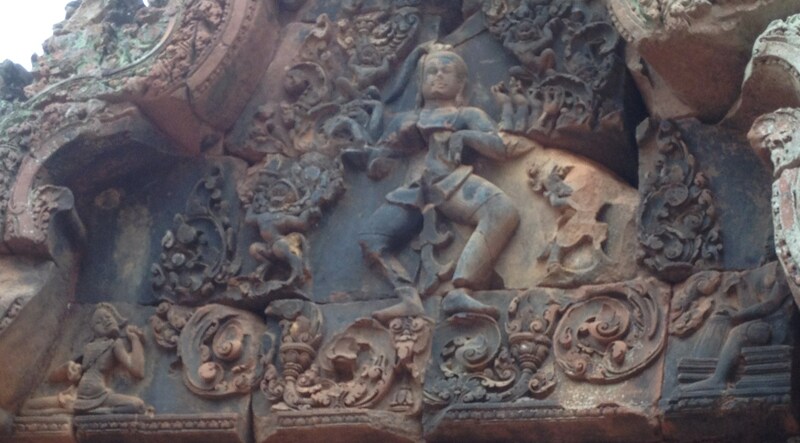 -Karaikkal Ammai is sculpted to the right of Adalvallan/Dancing Shiva. The same is seen in Prasat Preah Vihear too. It is also necessary to mention that apart from these temples, the lintel placed outside Battambang museum shows Ammai to the left of Shiva. 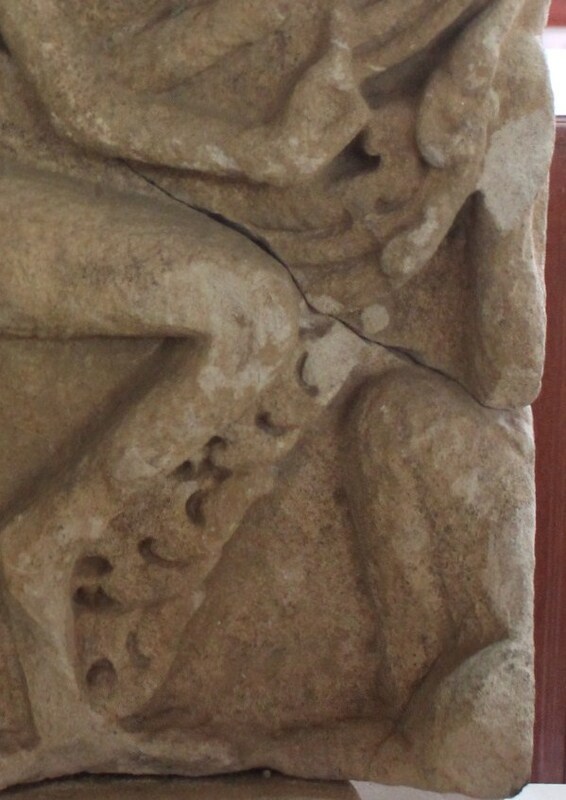 One of the two broken pediments inside the same museum shows a squatted figure to Shiva’s right and one is seen sitting to his left. The temple of Preah Vihear is not a “Hindu monument” but a Khmer sanctuary, built by Khmer kings and dedicated to Shiva the Hindu god. It should be understood that for past Khmer kings, a sanctuary was first and foremost a cosmological recreation. Thus, the construction of Khmer sanctuaries in the form of multi-tiered Pyramids meant that the place was considered a sacred cosmic mountain. This was particularly noticeable in the temples dedicated to Shiva, because of the association with the god’s mountain home –Mount Kailasa-. A mountain or a cliff top location, as in the case of Preah Vihear, was always the first choice for the Khmer architects building these major temples. Below are the verses from Sekkizhar’s Periya Puranam (12th Century) about Ammai’s Trek to Mount Kailash. Sekkizhar explains Karaikkal Ammai’s ascent to Mount Kailash to see her Lord’s Dance. With a speed exceeding that of the mind She traveled fast the realms in the north; She came near the Mount Kailas of pervasive radiance Where abides the Wielder of the Trident, decked with A garland of Konrai blooms burgeoning in serried order; She durst not tread with her feet the holy ascent But measured it with her head. It certainly cannot be a simple temple architectural display to portray Dancing Shiva on a hill, especially in a cliff temple recreated as Mount Kailash, alongside his Demon Devotee watching his dance in Religious Ecstasy. While Lord Shiva, the Cosmic Dancer is an embodiment of Mysticism, Karaikkal Ammai’s poetry is manifestation of Devotional Mysticism. 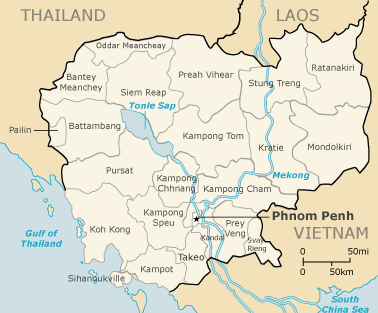 19th century Cambodia came under the control of Vietnamese and French. The French continued their rule into 20th century and Japanese took over. After a while, the Japanese gave up to the French again. Only in the 1950s Cambodia became an independent state, later to be completely devastated by the brutal Khmer Rouge. In the heritage site affected by both natural and man-made catastrophes, historically seems mostly man-made time and again,many of the lintels and most of the carvings on the lintels have taken a strong blow. Beyond various clashes of former Empires, disputes among later Countries, 20th Century Cambodia also suffered at the hands of the brutal Khmer Rouge. From 1975 until 1978 the Khmer Rouge held Prasat Preah Vihear and maintained it as their strategic resistance spot. Hence, making the pathway to the cliff landmine infested and restricted to tourists. Additionally, with intermittent armed conflict and legal battle fought at the Hague based International Court of Justice, with neighboring Thailand over the temple, the once sacred worship place is a soldier-occupied military arena with de-mining activities still on the go. Many researches done on Khmer temples have taken a back seat due to these various conflicts the heritage country has suffered. 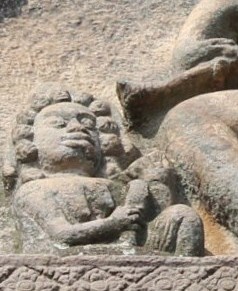 In 1976, Mireille Bénisti had published an article which stated that Karaikkal Ammai was depicted in Khmer Art. She found a lintel in Vat Baset where she found a figure that she claimed could be Ammai. The researches do not seem to have continued further, mainly due to the above mentioned clashes and conflicts. Mareille Benisti was a French Indologist and author of various books on Khmer Monuments and Buddhist and Hindu Art of India and Cambodia. Her book ‘Stylistics of Early Khmer Art’ studies the relations between early Khmer and Indian art during the 7th and 8th centuries. Earlier, in the Second International Tamil Conference Seminar held in the year 1968, in Madras – today’s Chennai- the capital of Tamilnadu, Mareille Benisti had given a presentation on the title – ‘Karaikkalammaiyar in Cambodia’. Her presentation was under the theme – Archeology and the Arts (Archaeology and Epigraphy). 2014-2015 are successful years for the temple. 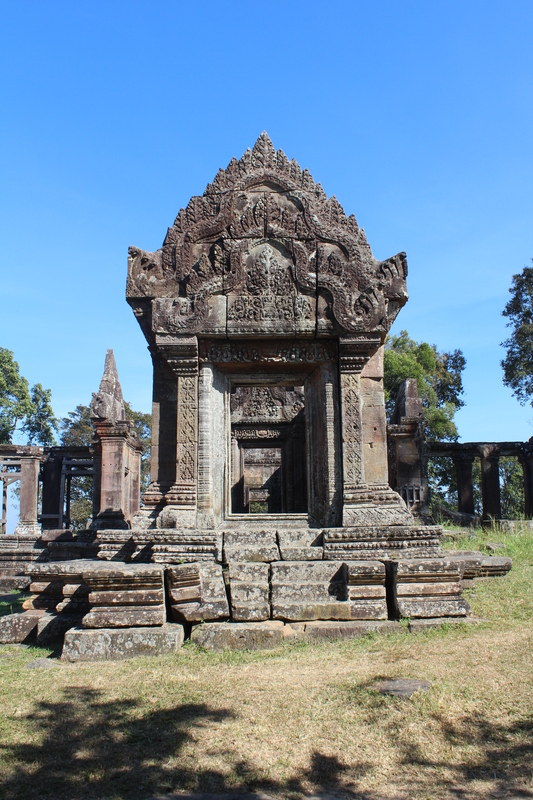 The International Coordinating Committee (ICC) for Preah Vihear Temple Complex was established in December 2014. 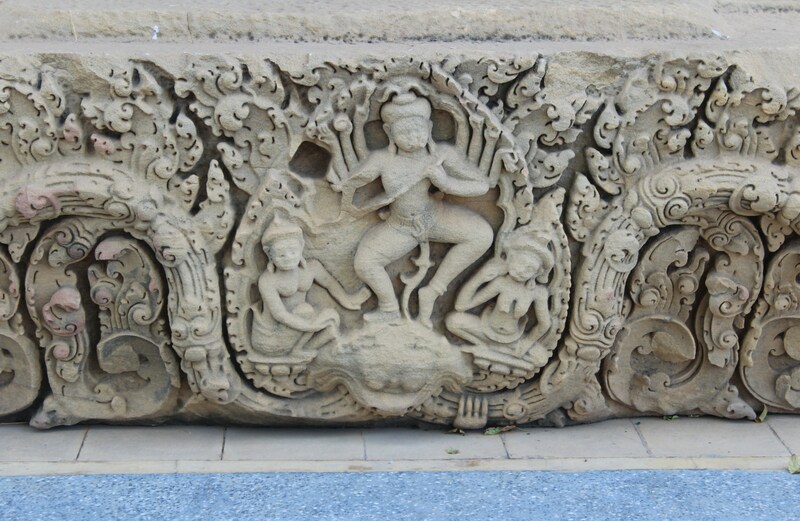 In 2015, India and China have agreed to co-chair the Renovation and Protection of the Temple, thereby play important roles in preserving the Khmer Heritage Sanctuary. 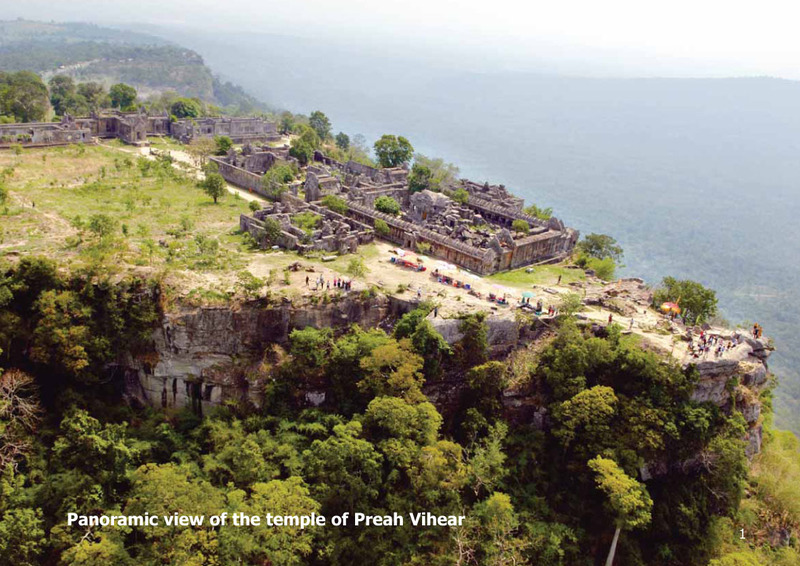 Due to the undeviating efforts of Cambodian Government, today, Preah Vihear is a sort after historic monument, with the terrain making it an additional attraction for adventure tourism. 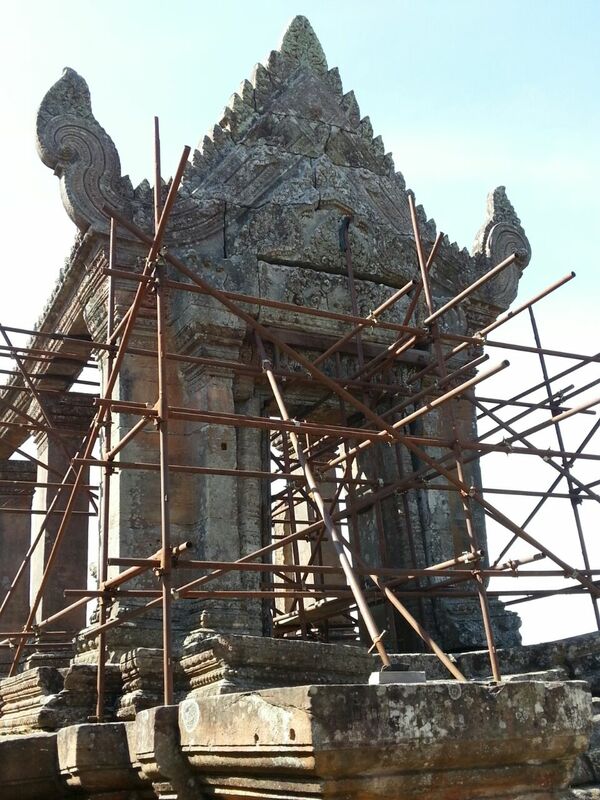 De-mining in full force and Tourism in total swing, Preah Vihear is getting renovated, hopefully with ancient history intact. The above notings on conflicts and clashes were not meant to deviate the topic of Karaikkal Ammai, but to reinforce the need for all-inclusive researches with several hindrances removed in the present millennium. With renovations and reformations taking place in the UNESCO site, the sculpture should be viewed in new light, not only in terms of Iconography and History, but also relate to the Religious Connections of the Khmer Empire and the Tamil Empires of Pallavas and later, the Cholas. There are very few reference/research books available to the interested reader. This state needs to improve. Additionally, emphasis should be thrown upon the Traders Guilds of yesteryear Tamil Land which were prominent beyond borders throughout South East Asia including China. Along with the Religious Connect, Economic Connect should also form an important theme of New Age Studies. Especially, in the case of Karaikkal Ammai who belonged to the Trader Community in the Pallava Land of Tamizhagam.